Featuring Sydney Band "Little Spoon"; and local artists "The Smith Sisters"; "Chasing Grace"; and "Ruby Tuesday". Michelle Plozza and Sammy White have been selected to be part of Team Australia at the "Vocal Olympics" at the World Championships of Performing Arts in LA in July. 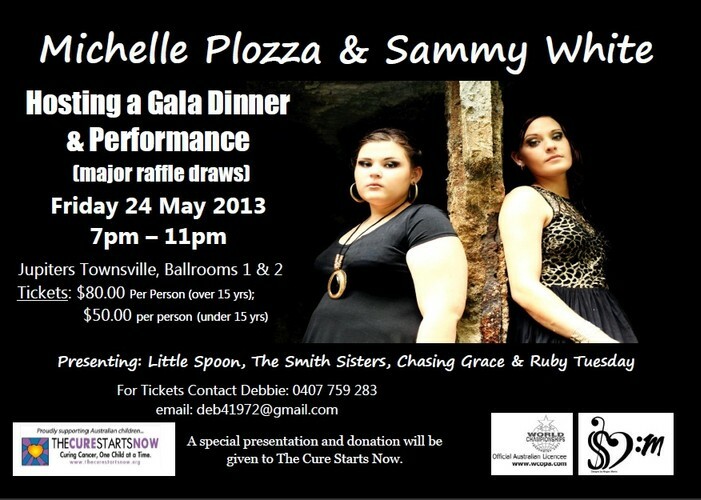 Michelle and Sammy will showcase their talents and why they were chosen to represent Australia. Help them get to LA by coming along to their event and cheer them on to "bring home Gold". Major raffle draws and a special presentation to "The Cure Starts Now". Admission includes a Buffet Dinner, drink on arrival and entertainment.